Add some personality to your home with our elegant sliding doors, made to measure for any area of your home. Sliding doors are customized with fillings that reflects your style. A solid and timeless sliding door, inspired by the tranquility and impressions of the forest. The clean design of “Scenic” adds a wooden touch that fits well in modern, as well as more classic, home decór environments. 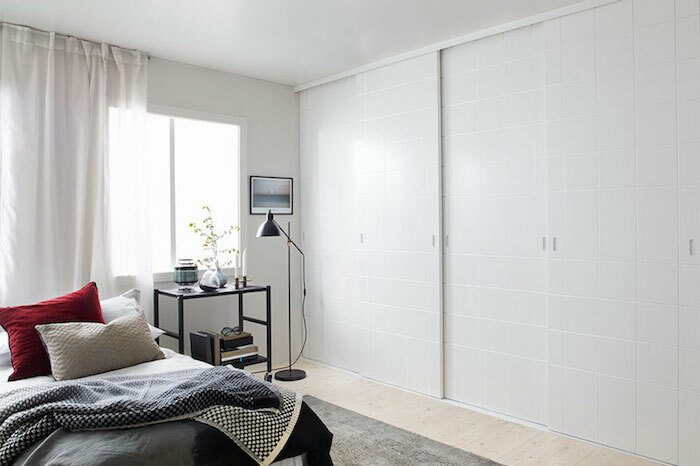 Our collection of frameless sliding doors have a sleek and discreet profile, softening their feel and lending a stylish calm that is a pleasure to live with. As with every Elfa sliding door, both Scenic and Linear are fully made-to-measure and available with popular customisation features such as integrated LED lighting and soft-close. And with the same great look on both sides, you’re not limited to the closet — try them as room dividers or partitions. We are now introducing a series of frame free sliding doors. Given their minimalistic, Scandinavian design they are sure to add a sense of elegance and calm to any space.